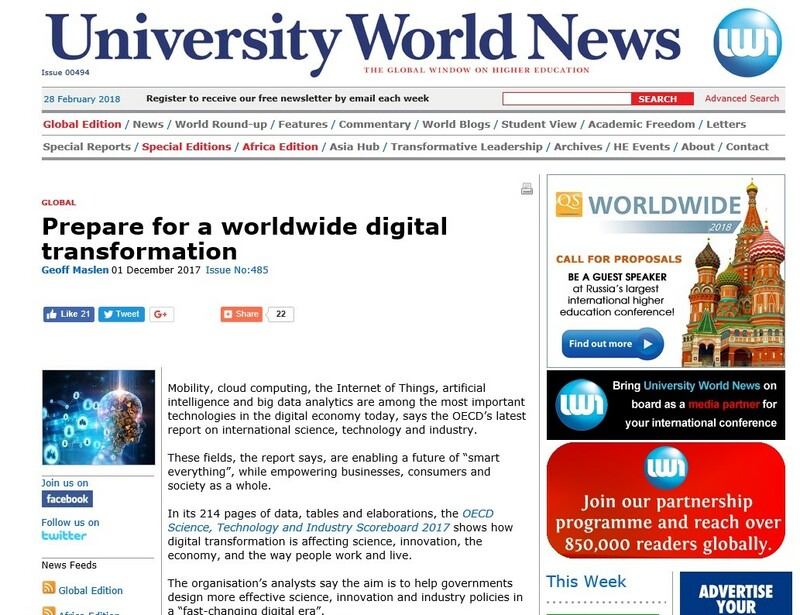 Mobility, cloud computing, the Internet of Things, artificial intelligence and big data analytics are among the most important technologies in the digital economy today, says the OECD’s latest report on international science, technology and industry. These fields, the report says, are enabling a future of “smart everything”, while empowering businesses, consumers and society as a whole. In its 214 pages of data, tables and elaborations, the OECD Science, Technology and Industry Scoreboard 2017 shows how digital transformation is affecting science, innovation, the economy, and the way people work and live. The organisation’s analysts say the aim is to help governments design more effective science, innovation and industry policies in a “fast-changing digital era”. Scoreboard 2017 draws on the latest internationally comparable data “to uncover the strengths of country members of the OECD and other leading economies”. It sets out to show how digital transformation is affecting science, innovation, the economy, and the lives of humans around the globe. Featuring indicators traditionally used to monitor developments in science, technology, innovation and industry, the report complements these with new and experimental indicators that provide “novel insights into areas of policy interest”. The aim of the STI Scoreboard is not to “rank countries or develop composite indicators”, the report states. Instead, the objective is to provide policy-makers and analysts with the means to compare economies with others of similar size, or with a similar structure, and to monitor progress towards desired national or supranational policy goals. The writers draw on OECD efforts to build data infrastructure linking actors, outcomes and impacts, highlighting the potential and limits of certain metrics, as well as indicating directions for further work. Artificial intelligence or AI technologies, as measured by inventions patented in the five top intellectual property offices, known as IP5, increased by 6% per year on average between 2010 and 2015, twice the average annual growth rate observed for all patents, the report says. In 2015, 18,000 AI inventions were filed worldwide with Japan, South Korea and the United States accounting for more than 62%, with up to 30% of patents filed on medical diagnostics that include AI-related components. The report notes that over the past 15 years, China has tripled its high-impact scientific efforts – as measured by its 14% share of the top 10% most-cited publications. This makes China the second-largest scientific powerhouse behind the United States’ 25% share. The US leads in machine learning research followed by China, while India has also entered the game and now accounts for a third of papers published in this field. But India actually ranks fourth behind the United Kingdom when adjustments are made for “quality”, the report states. According to the OECD analysts, machine-to-machine communication, or M2M, is the key to enabling the Internet of Things and here China has taken the lead: In June 2017, the giant Asian nation accounted for 44% of worldwide M2M sim card subscriptions – three times the share of the United States. Research and development is a massively concentrated activity in a tiny number of nations, the OECD analysis reveals. Within national economies a small number of firms are similarly responsible for a large proportion of total business R&D. In fact, the 50 largest domestic R&D performers account for 40% of business R&D efforts in Canada and the United States, and for 55% in Germany and Japan. The headquarters of the top 2,000 R&D corporations worldwide are also concentrated in just a few economies – notably America, Japan and China. About 70% of their total R&D spending is likewise concentrated in the top 200 firms. Not surprisingly, these top 2,000 R&D firms lead in the development of digital technologies and they own about 75% of global ICT-related patents, 55% of ICT-related designs and 75% of the IP5 patent families related to AI. OECD countries spent 0.4% of gross domestic product on higher education R&D in 2015, its report states. However, expenditure in Denmark, Switzerland and Sweden was more than twice this amount. Between 2005 and 2015, the proportion spent increased in most countries but decreased markedly in Hungary and Israel. Higher education institutions and government research organisations are responsible for more than three quarters of basic research on average, the analysts found. In terms of expenditure on tertiary education and vocational programmes, America, Canada and South Korea headed the list of 35 OECD countries assessed, while Australia was ranked sixth and Britain eighth. Rankings for gross expenditure on research and development placed Israel and Korea at the top two spots with the US in 10th place, Australia 15th and the UK more than halfway down at 22nd. technology or ICT, however, had Britain in 14th place, in front of Korea, Canada and Spain, with Australia at number 18. “Researchers and other R&D personnel constitute a vital input to R&D performance,” the report says. “Measured on a full-time equivalent basis, more than 2% of persons employed in Denmark, Finland and Israel work in R&D – almost double the 1.1% average of other countries.” Norway and Ireland also rank highly even though their R&D spending is below the OECD average. Business and higher education sectors are the main employers of researchers although business has the greatest share, with more than 70% of researchers in Israel, Japan, Korea, and the United States. The share of researchers working in the business sector also increased markedly between 2005 and 2015 in Hungary, Poland and Turkey, but fell in Greece, Luxembourg, Mexico and South Africa. In the OECD area, approximately 30% of graduates in the natural sciences, engineering and ICTs are women. Yet only 22% of scientific authors are female, a figure that is even lower for sub-groups of authors, such as those engaged in paid review or editorial activity, or those fully dedicated to research. Although more than 40% of researchers in Estonia, Latvia, Portugal, the Slovak Republic and South Africa are women, fewer than 25% are in Austria, the Czech Republic and Germany. The proportion of patents featuring women inventors ranges between about 4% in Austria to more than 15% in Portugal. At work, women also often earn significantly less than men, even after individual and job-related characteristics are taken into consideration. Skills, in particular ICT skills, partially explain the gender wage gap across countries, the report says. But estimates suggest that, other things being equal, returns for undertaking ICT jobs are higher for women than for men. “Training women and endowing them with additional ICT skills may therefore contribute to increasing their wages and help bridge the gender wage gap,” it adds. Higher education institutions often employ the greatest share of women researchers. In Luxembourg, the creation of the country’s first and only public research university in 2003 helped to produce a 10 percentage point increase in women researchers up to 2015. The indicator of top-cited publications provides a “quality adjusted” measure of research output, the report says. In 2015, the United States led in the production of scientific publications with nearly half a million. China accounted for the second-largest number of top-cited documents, with nearly as many as Germany and the United Kingdom combined. Switzerland had the largest share of domestic scientific documents with a high citation impact, closely followed by the Netherlands. Over the 2005-15 period, international collaboration on scientific research intensified worldwide. China almost doubled its collaboration rate, albeit from a very low base. In 2015, Luxembourg, Iceland, Switzerland and Belgium were the OECD countries with the largest propensity to collaborate internationally. The report says measures of scientific research collaboration and citation impact – a quality measure of scientific publishing – at the country level are positively correlated, especially for economies with lower levels of scientific production. These smaller economies attempt to overcome their limited scale by participating more intensively in global networks. “Joint analysis of excellence and leading authorship, that is the affiliation of the leading author, provides further insight into the source of a country’s top-cited publications,” the report says. It notes that many of the publications are underpinned by international collaborations, often led by authors with foreign affiliations. Again, the United States accounts for the largest share of top-cited publications led by domestic authors, followed by the Netherlands, Switzerland, Denmark and Britain. Some countries have high overall excellence rates thanks to the contribution of collaborative articles led by authors abroad, the report says. International mobility among highly educated individuals at different stages of their personal development and professional careers constitutes a key driver of knowledge circulation worldwide. As is well known, America attracts the largest number of international tertiary students with close to 1 million, followed by Britain with 400,000. The field distribution of international students is also an indicator of each country’s perceived strengths. For example, relatively high proportions of overseas students are found in Finland for ICTs, the United Kingdom for social sciences and humanities, Switzerland for the natural sciences and mathematics, and Germany for engineering. The report makes the obvious point that scientist mobility facilitates the circulation of scientific knowledge. It says one way to track the mobility of scientists is to trace changes in institutional affiliation over their list of publications in scholarly journals. This approach shows that “brain circulation” or “churn” is far more important than brain gain or drain – that is, net flows of people. The nine largest international bilateral flows of scientists over the decade to 2016 involved exchanges with the United States. Of the top 40 connections, the US was a net beneficiary in 14 cases, followed by Britain with six and China with five. Authors based in Luxembourg and Switzerland experienced the highest mobility rates within the OECD in 2016. For the median economy, 95% of scientists that year were already based there at the time of their previous publication. But mobility patterns vary across economies; for example, in Israel and Italy, a majority of inflows are “turnees” originally affiliated to an institution in the country. In Switzerland, the majority of researchers with an international mobility record represented new inflows. “With few exceptions, individuals not changing economy affiliations – the stayers – are more likely to publish in journals of lower prestige,” the report states. In a comment that academics might well pass on to their students, the OECD analysts point out that the creation, adoption and effective use of new technology require appropriate skills. Economies where workers use ICT more intensively at work, such as in the Netherlands, Norway and New Zealand, also have a higher share of “non-routine jobs” involving relatively complex tasks. In addition, workers in jobs that are 10% more ICT-intensive than the average job may earn hourly wages that are up to 4% higher. But the analysts also note that ICT skills alone are insufficient to “thrive in the digital economy”.